French side Nice have reportedly earmarked Liverpool goalkeeper Simon Mignolet as a potential target for the winter transfer window. The Belgium international in his sixth campaign with the Reds but he has been restricted to just one appearance in the League Cup since the current season started. According to The Sun, Nice are among the sides considering an approach for Mignolet with manager Patrick Vieira looking for a fresh face between the sticks. Nice have conceded only 14 goals from 12 league matches this term but Vieira is still said to have question marks over the contributions of both Walter Benitez and Yoan Cardinale. 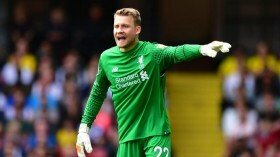 Mignolet had sought an exit from Anfield during the summer but his attempt was blocked by Jurgen Klopp after Loris Karius made his way to Besiktas on a two-year loan. Based on this, the German may have hold a similar stance when the transfer window reopens and Mignolet's departure may depend on whether the Reds can pursue a replacement.